Pythagoras was an ancient Greek philosopher who lived in the 6th century BC, but his mathematical work is still relevant to our lives today. He was one of the first people to study the properties of numbers, the relationships between them, and the patterns they produce – in other words, to do maths. He’s most famous for the equation that bears his name, a2 + b2 = c2, which describes the connection between the sides of a right-angled triangle. People use Pythagoras’ Theorem in all sorts of ways, from interior design to medical imaging. Pythagoras didn’t come up with this result though, as the Chinese and Babylonians used it a thousand years before. He gets the credit because he showed it was true for all right-angled triangles, demonstrating the importance of mathematical proof. This wasn’t his only accomplishment. 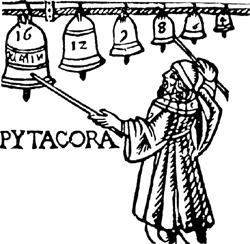 Pythagoras also discovered the connection between maths and music, explaining why only some notes sound harmonious together. He established a school of philosophy and, with his students, studied the golden ratio – a numerical relationship that the Pythagoreans believed was particularly beautiful and often turns up in nature and the arts. 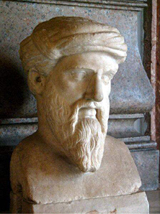 For someone so influential, we know surprisingly little about Pythagoras. Historians can’t even agree on the year he was born! None of his own writing survives, so we’ve learnt about his life and teachings through the work of his students and others. This makes Pythagoras rather mythical, and it can be hard to separate fact from fiction. What we do know for certain is that he left behind a mathematical legacy that has lasted for thousands of years.